Anthony Davis was born October 11, 1989 in Piscataway. Anthony grew up in Piscataway, playing organized football and basketball. He was an ideal lineman—big, quick, strong and aggressive. He had the skills of a defensive lineman but preferred to play on the other side of the ball. He longed to play in the NFL, and used to get jealous watching grown-up offensive linemen play in the Super Bowl. Anthony also had a Charles Barkley-like presence on the basketball court, thunderous dunks included. He once shattered a backboard in high school. 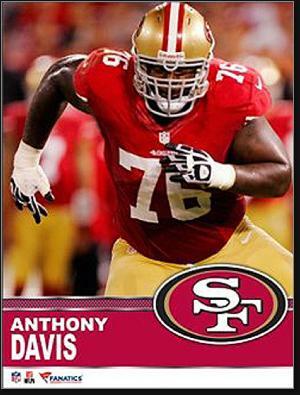 As a freshman at Piscataway High School, Anthony was a member of the Chiefs’ state championship team. He became a starter the following season, teaming with future NFL players Malcolm Jenkins and Kyle Wilson to lead Piscataway to an undefeated record and another state title. At 6’5” and 300 pounds, Anthony had little trouble pancaking his high-school opponents. As a senior, he was named a First-Team Prep All-American by USA Today, rated the top player in New Jersey and regarded among the Top 10 offensive line prospects in the country. Ohio State recruited Anthony very aggressively, but he chose to remain in-state, becoming Greg Schiano’s first #1 recruit, in 2007. The Scarlet Knights had been talking to him since his freshman year. Anthony won the starting right guard job midway through his freshman year as Rutgers went 8–5 and scored a big victory over #2 nationally ranked South Florida. The Scarlet Knights played in the International Bowl and demolished Ball State 52–30. Anthony was honored as a Freshman All-American. Anthony moved to left tackle and played two seasons at the position. He earned All-Big East honors both years and was a Second Team All-American as a junior in 2009. Rutgers concluded each of these seasons with a bowl victory. Anthony decided to skip his senior year and go into the NFL Draft after being projected as a first-round pick. The San Francisco 49ers took him with the 11th overall selection after trading up to get him. He stepped right in to the starting right tackle slot and did not miss a game in his first three NFL seasons. In 2012, Anthony got to live his childhood dream of playing in the Super Bowl. Unfortunately, the 49ers fell to the Ravens, 34–31. In 2014, Anthony missed 9 games to various inuries, and the San Francisco ground game suffered. Frank Gore put up robust numbers when Anthony was on the field, but Gore's production plummeted when his replacement was in the lineup. It marked the first time as a pro Anthony missed significant playing time. Prior to training camp in 2015, Anthony shocked NFL fans by announcing his temporary retirement. The head injury suffered during the previous season spooked him, and he decided to let his mind and body heal before making any final career decisions. Coupled with the retirement of 24-year-old linebacker Chris Borland over similar concerns, Anthony’s absence contributed to a disappointing 5–11 season.